Large foiled chocolate bar moulded with "First Holy Communion" in choice of foil colours. Large plain foiled chocolate bar in choice of foil colours - pack of 50. Large plain foiled chocolate bar in choice of foil colours - Sample - this is fortwo sample bars. Large foiled chocolate bar moulded with "Thank You For Sharing Our Special Day" and Twin Hearts in choice of foil colours - pack of 50. Large foiled chocolate bar moulded with "Thank You For Sharing Our Special Day" and Twin Hearts in choice of foil colours. Large foiled chocolate bar moulded with "Two Lives" verse in choice of foil colours - pack of 50. Large foiled chocolate bar moulded with "Two Lives" verse in choice of foil colours. Large foiled chocolate bar moulded with "Two Lives One Journey" and two hearts in choice of foil colours - pack of 50. Large foiled chocolate bar moulded with "Two Lives One Journey" and two hearts in choice of foil colours. Large foiled chocolate bar moulded with "Thank You For Sharing Our Special Day" in choice of foil colours - pack of 50. Large foiled chocolate bar moulded with "Thank You For Sharing Our Special Day" in choice of foil colours. Large foiled chocolate bar moulded with "Bite Me - I taste Like Chocolate" in choice of foil colours - pack of 50. A sample of this product is available under code FLLGBM_S. Large foiled chocolate bar moulded with "Bite Me - I taste Like Chocolate" in choice of foil colours. Large foiled chocolate bar moulded with "Thank You For Sharing Our Special Day" and brideand groom in choice of foil colours - pack of 50. Large chocolate champagne bottle. Milk chocolate presented in printed foil. Pack of 20. Add a custom printed sticker to personalise your chocolate. Foiled chocolate hearts foiled in choice of foil colours - pack of 10. Available in your choice of milk, white, dark or mixed chocolate. 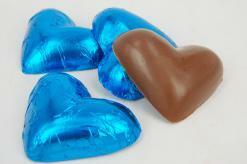 Foiled medium chocolate hearts foiled in choice of foil colours - pack of 30. Medium foiled chocolate bar moulded with "Holy Communion" in choice of foil colours - pack of 50. Medium foiled chocolate bar moulded with "Holy Communion" in choice of foil colours. Sample bars allow you to check foil colours, chocolate style and embossing prior to making your full order. Medium foiled chocolate bar moulded with "Thank You For Sharing Our Special Day" in choice of foil colours - pack of 50. Medium foiled chocolate bar moulded with "Thank You For Sharing Our Special Day" in choice of foil colours. Medium foiled chocolate bar moulded with "Today I Married" verse in choice of foil colours - pack of 50. Medium foiled chocolate bar moulded with "Today I Married" verse in choice of foil colours. Medium foiled chocolate bar moulded with "Two Lives" verse in choice of foil colours - pack of 50. Medium foiled chocolate bar moulded with "Two Lives" verse in choice of foil colours. Midi chocolate champagne bottle. Milk chocolate presented in printed foil. Pack of 20. Add a custom printed sticker to personalise your chocolate. Mini chocolate champagne bottle. Milk chocolate presented in printed foil. Pack of 30. Add a custom printed sticker to personalise your chocolate. Small foiled chocolate bar moulded with Bridge and Groom characters in choice of foil colours. 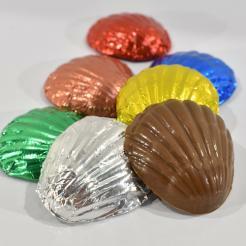 Foiled chocolate small frangipani chocolates foiled in choice of foil colours - pack of 50. 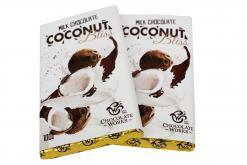 Small plain foiled chocolate bar in choice of foil colours - pack of 50. Small foiled chocolate bar moulded with "Thank You For Sharing Our Special Day" in choice of foil colours - pack of 50. Small foiled chocolate bar moulded with "Thank You For Sharing Our Special Day" in choice of foil colours. Foiled chocolate stars foiled in choice of foil colours - pack of 100. Foiled chocolate hearts embossed with Thank You For Sharing Our Day foiled in choice of foil colours - pack of 50. Foiled chocolate hearts embossed with Thank You For Sharing Our Day foiled in choice of foil colours - SAMPLE. Extra Large (life size) chocolate champagne bottle. Milk chocolate presented in printed foil. Pack of 6. Add a custom printed sticker to personalise your chocolate. Small foiled chocolate bar moulded with Bridge and Groom characters in choice of foil colours - pack of 50. Foiled chocolate lips foiled in choice of foil colours. Foiled chocolate hearts embossed with Mad About You foiled in choice of foil colours - pack of 50. Medium plain foiled chocolate bar in choice of foil colours.